NEW YORK, New York — Thanks to a major infrastructure project implemented by the Hayastan All-Armenian Fund, the residents of Noragyugh, a village in Artsakh’s Askeran Region, now have access to regular drinking-water service. 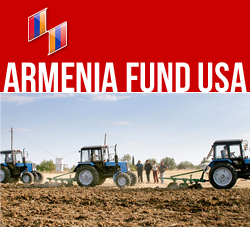 The critically needed initiative, which has already breathed new life into the community, is co-financed by the Fund’s French affiliate and Armenian entrepreneurs in Russia. To date, the Fund has rebuilt a five-kilometer-long pipeline and constructed a distribution network, connecting all Noragyugh households to the grid and providing them with a regular supply of potable water. Currently, construction crews are working on the last leg of the project, the rebuilding of three reservoirs as well as a deep-water well. According to the chief engineer, water volume will significantly increase once these improvements are completed. For many years, Noragyugh’s pipeline was in a state of disrepair, with corroded pipes causing extensive water loss. The village received water once every two days, and only for two hours at a time. “We have long waited for the day when water would flow into our homes,” says Mayor Edik Mardyan, reflecting a sentiment shared by all residents. “The fact that there can be no life without water is even more pronounced in a village, where water is also a prerequisite for economic development,” says Bedros Terzian, chairman of the Fund’s French affiliate. Established in 1966, Noragyugh is Askeran’s largest community, with a population of 1,510. Farming is the main occupation. The village has a modern school and a medical clinic as well as well-built roads. Today, in light of the fact that the water issue has been resolved, residents believe that their community is poised for considerable economic growth in the years ahead.